'S e dùthaich eileanach ann an Roinn a' Chuain Shèimh a tha ann an Niue. Tha far-ainm oirre: "Creag na h-Ioma-Eileanan". Tha riaghaltas aice fèin, ach tha ceangal poileiteagach làidir ri Sealainn Nuadh. Tha i na laighe mu 2,400 cilemeatair air falbh san ear-thuath Sealainn Nuadh eadar Tonga, Samoa, agus Cook Islands. B' e Captain James Cook a chiad seòladair a ràinig Niue anns a’ bhliadhna 1774. Chuir esan an t-ainm "Savage Island" ris an eilean o chionn 's gun robh coltas ri muinntir Niue a bhith gan dathadh le fuil. Ach cha b’ e fuil a bha oirre ach dath banana dearg. Cleachdar an cànan Niueanaich agus a’ Bheurla anns na sgoiltean agus anns na chòmhraidhean làitheil. 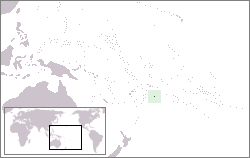 Air a tharraing à "https://gd.wikipedia.org/w/index.php?title=Niue&oldid=539342"
Chaidh an duilleag seo a dheasachadh 21 dhen t-Sultain 2017 aig 17:25 turas mu dheireadh.